The Drag Area allows you to move the Bar on the screen by pressing and holding down the mouse button while moving the mouse. You can drag the Bar out of the frame and make it a floating window. If you close the window (click on the X) the floating window goes back to its place. You can also move it to another location on the screen (left, right, bottom). The Markers indicate the colors of your Left and Right Mouse Buttons. If you Left-Click on a clue - the Left Marker will change to the color that you clicked on. The same happens with the Right Marker if you Right-Click on a clue. 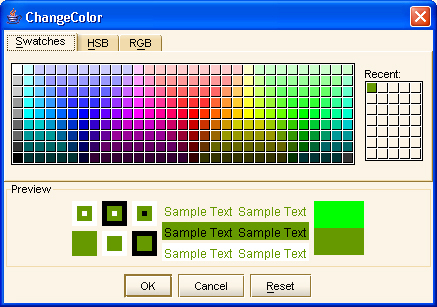 In 2-color puzzles the Left Button designates the Clues and the Right Button designates the Background as the default. 这是所有在使用中的颜色列表。 您可点击每个方格以把颜色安置在鼠标的左/右键。 您也可以选择使用键盘键（1-9，a-z）来选择颜色： 键盘键 -在鼠标左键安置颜色。 shift+键盘的关键 -在鼠标右键安置颜色..